Barter Books : Benson, E F; Ledwidge, Natacha [illus.] 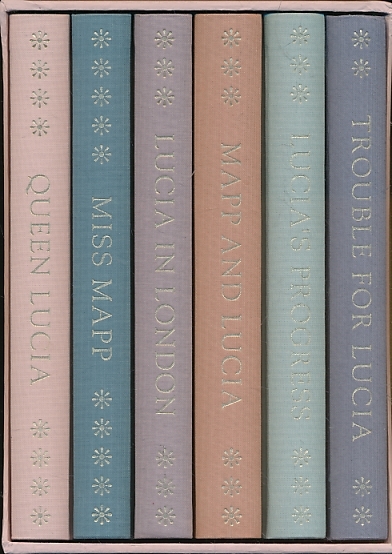 : The Mapp and Lucia Novels. Mapp and Lucia + Miss Mapp + Queen Lucia + Lucia in London + Lucia's Progress + Trouble for Lucia. 6 volume set. 230 x 150 mm (9 x 6 inches) - 278pp; 232pp; 243pp; 232pp; 231pp; 231pp. Blue, green and lavendar hardback cloth covers with gilt titles. Pale blue illustrated slipcase. VG : in very good condition with pink slipcase.